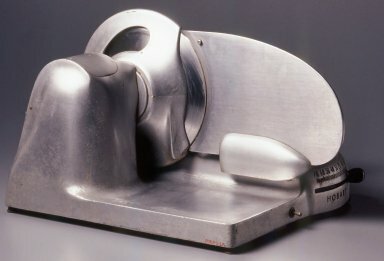 Stream-lined, steel electric meat slicer with a circular blade composed of several pieces joined together with screws and bolts. Directional orientation based on viewer's perspective if facing the short "front" end with the power switch and numbered gauge. Main unit has generally rectangular base raised on four rubber feet; all corners and edges rounded; power switch centered on front edge. Left front quadrant of base slightly concave to form tray to catch sliced meat; left back quadrant rises to high, rounded hump that houses motor; entire right side base rises about 4" to a flat platform. Front edge of this platform inscribed with gauge lines (numbered on the tens from 70 to 0, left to right) and a sliding black-painted knob to set slicing thickness. Rising upward from the left side of this platform is a vertical safety wall with rounded front and top edges that bisects the base from side to side; it is aligned with and in front of the blade and prevents the user from getting too close to the blade. The back edge of this safety wall is concave to conform to the circular blade; blade is encased in a disk that curves over blade's edge for safety and then is attached to the side of the rear left hump. A rectangular, two-walled tray for holding the meat is tipped up toward the rear and is suspended above the right side platform next to the blade; tray attached to main base by a continuous strut that extends from the bottom of the tray down along the right side of the platform and is then bolted to underside of base. All of the edges of the tray are flared outward; the front wall has a molded protuberance that juts forward from the center of its top edge. The sides of the back wall are bent back and joined by a bar running behind the back wall. Attached to this bar is the moveable meat holder comprised of an arm curves forward over the back wall of the tray and terminates in a rounded end; a cylindrical, grooved hand grip is attached to the right of this end and a semi-circular flat plate set parallel to the blade is attached to the left side. The semicircular plate is covered with raised points on side facing blade to secure meat in place; the whole arm piece slides along the bar to push meat into blade for slicing. CONDITION: Fair; shows extensive wear from use, including all over scratches, dirt and grease, discolorations, and rust spots; paint loss on knob for thickness gauge.